Buildings marked for demolition in Christchurch, New Zealand. 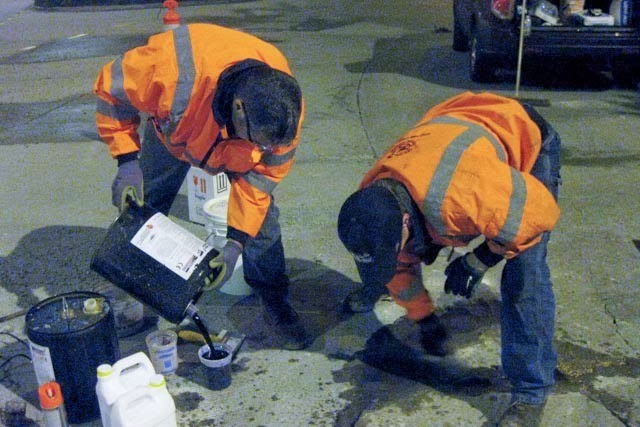 Recently, our Roadware distributor in New Zealand requested a list of best practices for using Roadware 10 Minute Concrete Mender™. 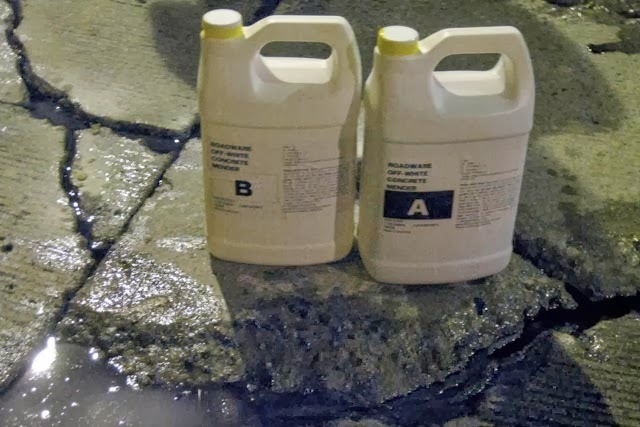 Contractors in Christchurch are using Concrete Mender to repair many meters of cracks following recent earthquakes. and shake or mix to re-blend before use. Read and follow illustrated instructions. splash back if applied erratically. Use a new flow-restrictor and mixer every time. release on the gun to stop the flow. Always apply a coating of Concrete Mender into the crack or spall before adding sand. This will give you better penetration and bonding. 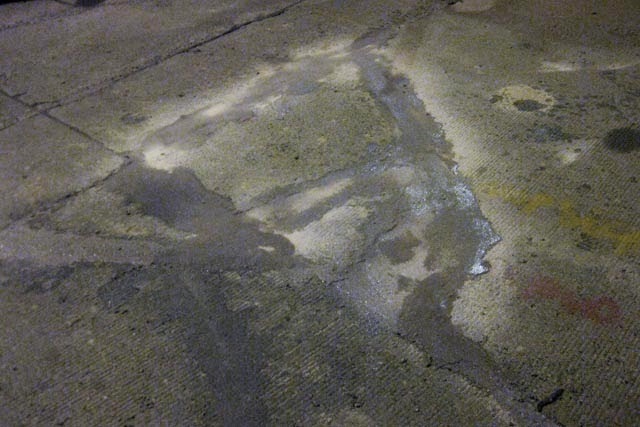 repair area are completely saturated with Concrete Mender. 11. If you suspect there is water on the bottom of the crack that you cannot remove, repair the bottom half first and allow it to cure (turn grey) before repairing the top half. 12. When working at below 0 degrees C, use a propane torch or similar method to remove any surface frost from the concrete before applying the material. Keep Concrete Mender and sand at room temperature before use. 13. Needle tip mixers are great for better control and pinpoint application. They also can easily clog up when left filled with mixed product. Do not try and force a mixer or tip to clear by adding more force to the gun. You can blow out the rear seals and cause a mess. Get a new mixer or tip and start over. Concrete Mender™ is injected into cracked walls in Christchurch, New Zealand. New Concrete Mender™ Mini Cartridge for precise application. oncrete Mender™, the industry’s only Microdoweling™ concrete repair polyurethane, is available in 50ml mini cartridges. The mini cartridge offers precise application control that is perfect for repairing hairline cracks. Each mini cartridge comes with a needle tip mixer and is simple to use. Use the 50 ml cartridge with the Roadware 5150 application tool. Each cartridge will repair about 10 feet of hairline cracks or 3 feet of 1/4 x 1/4 inch cracks. Roadware 80105 50ml 10 Minute Concrete Mender™ mini cartridge with mixer and needle tip. 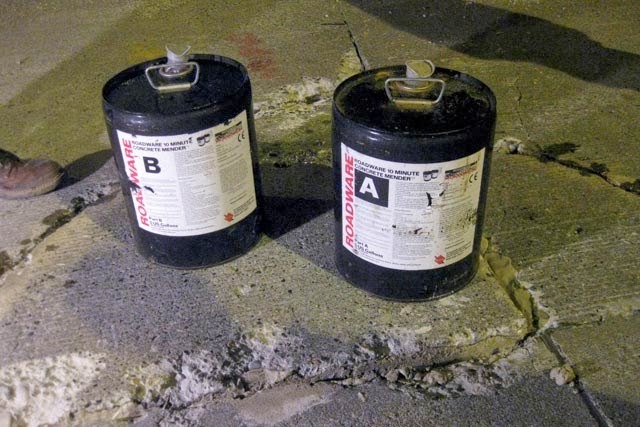 Use Roadware 10 Minute Concrete Mender to repair and re-bond delaminated concrete slabs. 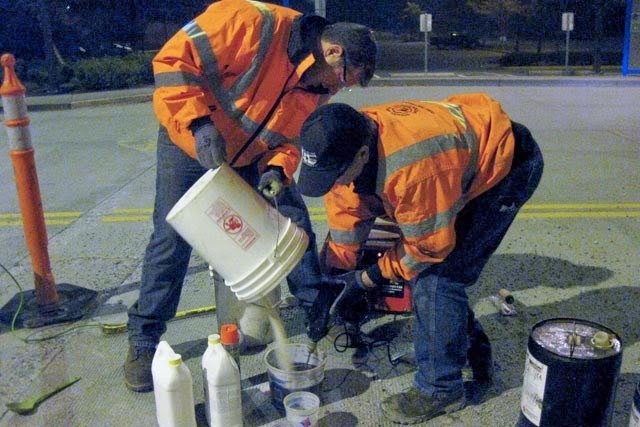 Roadware delimanition repairs are featured in the July 2008 issue of Concrete International. This is the official publication of the American Concrete Institute. 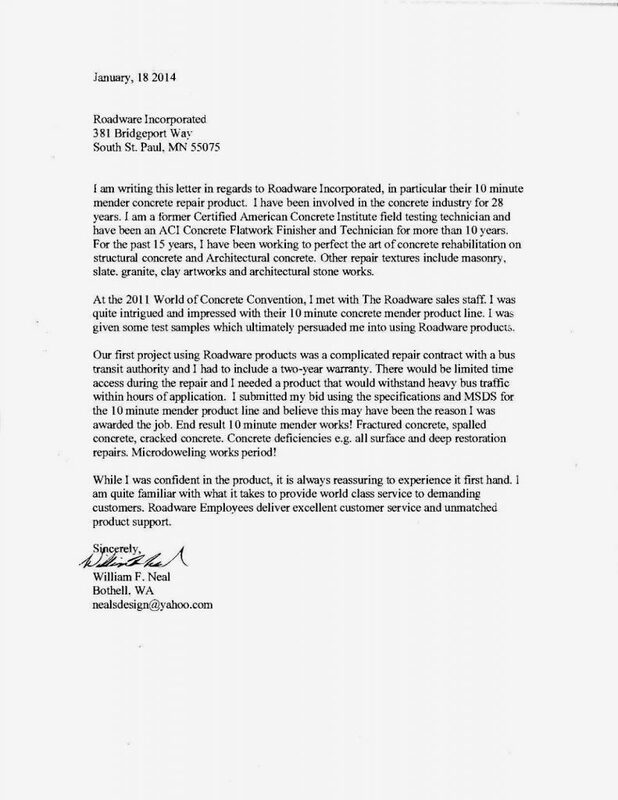 The article was written by Nelson Tonet, President of Express Polymers and a Roadware distributor. Here is a Roadware synopsis. Roadware 10 Minute Concrete Mender™ is an excellent choice for repairing concrete slab delaminations. The very low viscosity of less then 8 cps and the exclusive Microdoweling™ penetration properties of the material allow it to flow deep into delaminated concrete voids. The Concrete Mender will restore aggregate interlock and will allow dynamic load transfer under heavy traffic. The expense and mess of pressure injection with epoxy can be avoided. Two methods of repair have been successful. The first involved dry diamond drilling a 2 or 3 inch (5-8 cm) diameter hole into the concrete slab down to the delamination. Dust is removed with a shop vacuum. 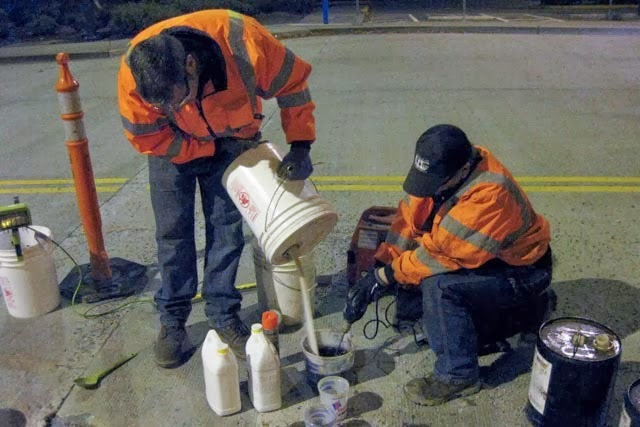 Roadware 10 Minute Concrete Mender is poured or pumped into the void. Only one or two inches (3-5 cm) of head pressure is required to push the material as far as 10 ft (3 m) into the delamination. When the material backs up to the top of the hole and the void is filled, silica sand is added and the hole is filled flush with the surface. Soundings are made with a hammer to verify the delamination is repaired in about 30 minutes after application. 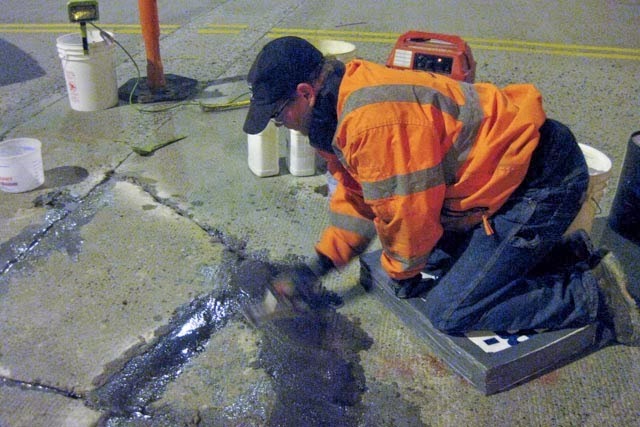 Click here to see how Nelson Tonet repairs delaminated concrete slabs. Another method is to drill multiple 3/8 inch (1 cm) holes into the concrete down to the delamination. Remove dust with a shop vacuum and inject pre-mixed Roadware 10 Minute Concrete Mender™ with a syringe tipped with a rubber gasket. With this method, you can actually see the material exit the adjacent hole and verify the material is filling the delaminated area. After filling, the holes are blended into the surrounding concrete with silica sand and Concrete Mender or re-drill 1/4″ (5 mm) deep and fill with a color matching concrete mortar. Both methods will yield good results and are more cost effective than epoxy injection. 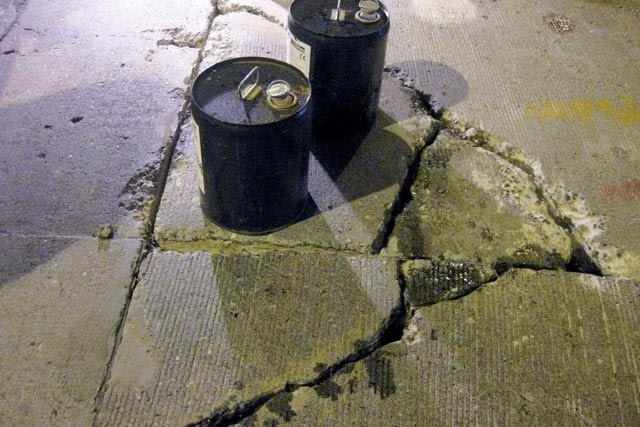 Repairing vertical cracks in concrete structures with Roadware 10 Minute Concrete Mender™. 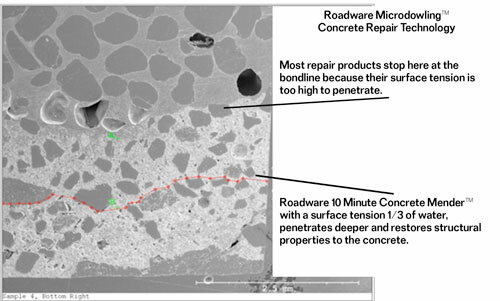 The same Microdoweling™ properties of Roadware 10 Minute Concrete Mender™ that make the material excellent for repairing horizontal surfaces also make a good choice for vertical repairs. UPDATE: New method recommended for vertical crack repair. See the Gebbie System. 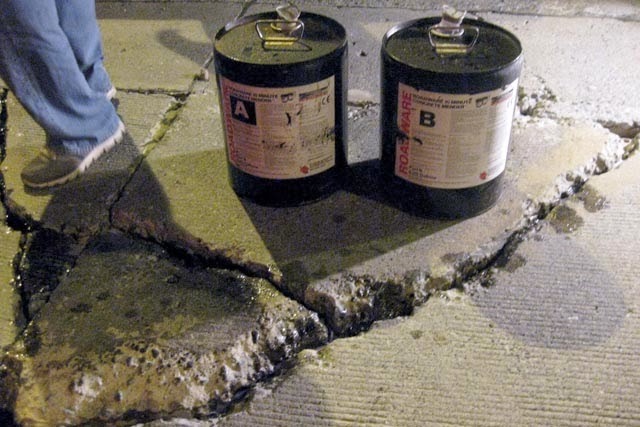 Roadware 10 Minute Concrete Mender™ is a very low viscosity polyurethane that uses a surface tension one-third of water to penetrate quickly and deeply into concrete cracks. The typical process relies on self-gravity injection to fill cracks completely. 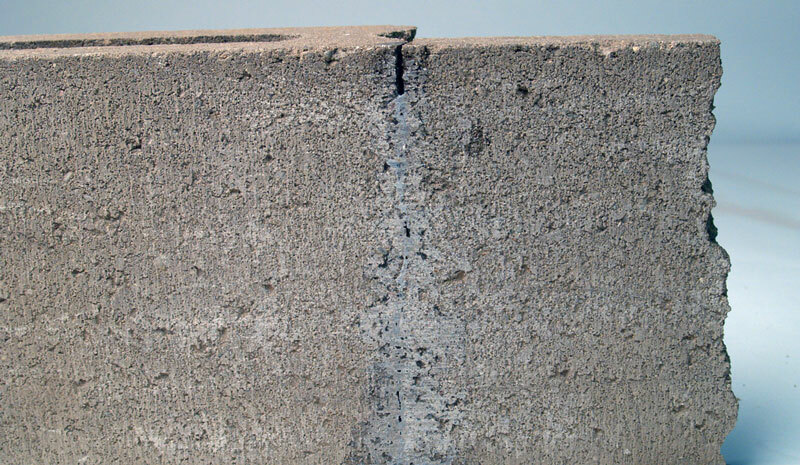 What is not seen by the naked eye is the capillary action of the Concrete Mender polymer chains flowing horizontally into the sidewalls of the crack. We call this chaining of polymers into the concrete Microdoweling™. This chaining of the concrete together works on vertical surfaces too. So, your saying, “How do we get this super thin material to stay in place long enough for the Microdoweling™ to take place and the repair to cure?” Over the years, Roadware contractors have come up with creative and ingenious ways to use Roadware 10 Minute Concrete Mender™ on vertical surfaces. Here are some techniques that have evolved. This technique involves covering the vertical crack with transparent duct tape and injecting Concrete Mender through the tape with a needle tip meter/mix cartridge. This method will work well if the concrete surface is smooth and the tape can make a good bond with the surface. The crack should be 1/4 inch (5mm) or less in width. The tape will make the, “form” while the Concrete Mender sets. Concrete Mender will not stick to duct tape, so once the material cures, you can cleanly pull off the tape. It is best to warm the cartridges up to 80° F (26°C) before use for a faster gel time. Start filling the crack at the lowest point and work you way up. Mix bulk Concrete Mender and 60-80 grit manufactured sand into a thick mortar. Working in small batches, use a margin trowel to make the repair. The fine sand will hold the Concrete Mender in place long enough for the Microdoweling™ effect to take place and for the material to set. This method uses a heavy duty, clear plastic bag to quickly mix one part of blended Concrete Mender to two parts of 60-80 grit manufactured sand. Once mixed by kneading the bag for several seconds, the bag is opened and the whole batch is applied and held in place with the bag. This technique is used around building mechanical entry points such as refrigeration and HVAC units. 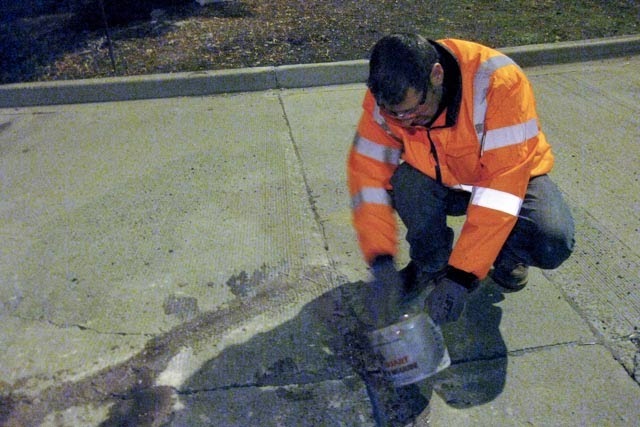 Whatever method you choose, Roadware 10 Minute Concrete Mender™ stands at the ready to perform. Finished repairs can be ground smooth and painted to match the wall if necessary.